I Sing Every Day is a lively collection of songs that Amy has collected over her years of teaching and working at summer camps. Some were learned in Girl Scouting programs and daycamps. They are performed with guitar, banjo, electric bass, keyboard, penny whistle, harmonica and percussion. 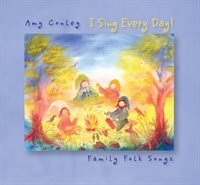 Great songs to sing in the car on trips, according to Amy's customers!